Vicki H. Moss was reared in Chattanooga, Tennessee during the week and raised on her family's Alabama farm during summer vacations and weekends. Her blood bled orange while attending the University of Tennessee but bled red every time she poured out stories that had to flow. It was all about embracing the red. Sometimes the process was painful, most of the time pure pleasure. Writing songs and keeping journals and diaries since she was nine, along with a neighborhood newsletter she typed on her mother's ancient Royal typewriter, she's published children's stories in magazines, poetry and nonfiction in adult magazines, and has won various awards in different adult genres while working on two young adult novels that have also won several awards. Those novels are waiting for a publisher. Previously Editor-at-Large for Southern Writers Magazine for two years and presently Contributing Editor, she's also a pundit for the American Daily Herald. A speaker and frequently on faculty for writing conferences, Vicki continues to write about the South. She's had the good fortune to study the Greek Bible with Dr. Spiros Zodhiates, editor of the Hebrew/Greek Bible and founder of AMG Publishing, while helping type one of his manuscripts. What a joy to help with one of his books. She's enjoyed inductively studying the Bible for the last twelve years at Precept Ministries International and has been certified to lead Precept Bible studies. She's also taught children's Sunday school classes and facilitated Beth Moore Bible studies. When she wasn't working at her barn and helping with her riding school, she waited for the farrier while sitting on a stool in the tack room writing stories about characters who rode horses. Vicki's been known to jump out of an airplane, raft wild rivers, tube gentle ones, ride a dirt bike on mountain trails, and a street bike down the Natchez Trace while writing about her adventures. She's hunted with Harris Hawks, learned to drive a horse and buggy, and jumped horses atop a sidesaddle in Scotland. She's trekked horseback through the Killykeen National Forest in Ireland and ridden an event horse on Donegal's beaches in Northern Ireland, a place where some of her Scotch-Irish ancestors lived before sailing to America. She once had a horse roll with her on Rotten Row, a sandy road in London's Hyde park where people have ridden on Sunday's for centuries when they weren't enjoying carriage rides. Swimming with giant turtles off Maui was an incredible experience while one of the scariest things she's ever done was a night dive to an underwater plane wreck off the island of Cozumel, Mexico. The black tip sharks she'd seen during the day had to still be lurking somewhere in the depths, however, it was worth the fright to glimpse an octopus venturing out at night by the beam of a flashlight. One of the most awesome sights she's seen was an underwater statue of Jesus Christ with arms open wide, the sun rays filtering down through the crystal clear water in Parkque Chankanaab, Mexico. A turning point in Vicki's life was when she discovered that God answered specific prayer. She found He was really concerned about more than the big picture. He was also concerned about the small details in each individual's life here on earth and if one was willing to hear His whisper, He would make Himself known in extraordinary ways. One such time was when Vicki was driving home from the Atlanta airport, she had a powerful feeling she was supposed to visit the campus of Berry College in Rome, Georgia, a place she'd never been. Late in the evening, she needed to hurry home, however, puzzled, she obeyed the strong urging to detour. Once there, she discovered that Berry College was one of the most beautiful college campuses, owning more land than any other. It was easily the largest land mass campus in the world with over 20,000 acres. Henry Ford had donated funds to help Martha Berry build majestic gothic buildings so the Appalachian mountain children could be educated and assisted in rising from their poverty after the Civil War had devastated the South. Still drawn in some mysterious way, Vicki later returned for another visit and was able to snap the photo of the beautiful swan on the opening page of the website. She toured the campus and visited Martha Berry's museum and home where the movies Remember The Titans and Sweet Home Alabama were filmed. It was before a display, on a plaque, she found a Rome, Georgia census from the 1800's listing her Berryhill ancestors as carpenters below Martha Berry's father's name. Vicki wondered if there was more than just finding a missing link in her genealogy. She trekked to Lavender Mountain to visit Martha Berry's Dream House. Why had God led her to this place? She held onto her faith, believing the answer would one day be revealed. She prayed where Martha used to pray, taking her thanksgivings and requests to God, just as Martha Berry had done before her. There was a sense of peace atop Lavender Mountain like no other place she'd ever visited. Planes flew almost within reach as did Red-tail Hawks hunting for prey from lofty updrafts. A magical place, the surrounding countryside was a magnificent panorama viewed from the heights of a prayer tower. It was three years later she realized why she had been led to Berry College and Martha Berry's rock house atop Lavender Mountain. 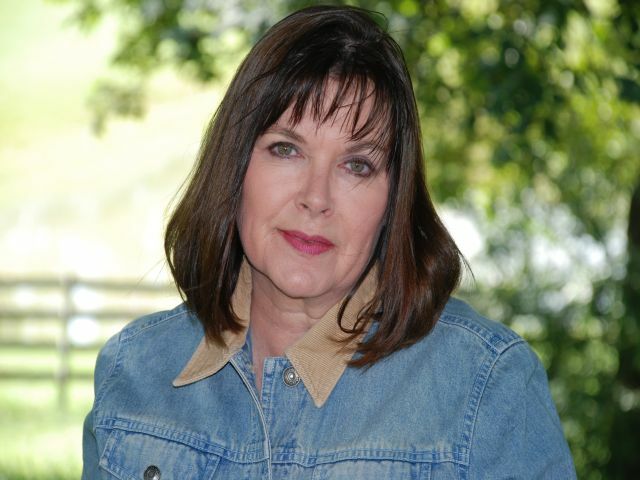 In 2007, during the time her father battled with lung cancer, her memoir, "No Tears In Heaven," was chosen to be read at the Southern Women Writers Conference. It seems God had led her there for a reason that was to unfold during one of her darkest hours. She was honored to read her work along with Maya Angelou, Jill McCorkle, and other great writers, and accepted back for the next two conferences as well. God was still leading. Vicki was still following. The Rock was always with her just as He promised.